So, tomorrow is May. What?! How the heck did that happen so fast? Although, I’m not sure why I’m acting surprised, by the pollen count, it’s been very obvious that Spring is in full-swing. And, of course, Spring means Mother’s Day! We all love mom’s, don’t we? mom’s are the best. The relationship between a mother and daughter can be rocky during those teenage, puberty, hormone years, but when you finally grow up and realize how much your mother loves you and are able to just enjoy your relationship with her as a friend, it’s the best kind of friendship. 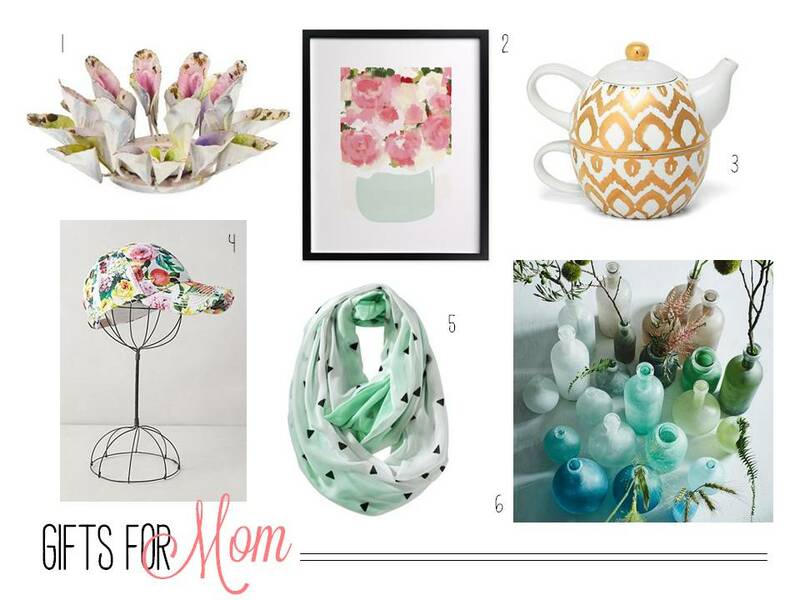 So, since Mother’s Day is just over a week away, I thought I’d help you out a little with some fun gift ideas for mom. I’m not even kidding about how much I love that floral hat from Anthropologie! Isn’t that so cute for mom?! Is it Monday? I swear it’s Monday…I mean, it doesn’t make sense that a Thursday would begin with someone ringing your doorbell incessantly at 6:45 a.m. causing your 80 lb dog to bark like someone just ripped his favorite bone out of his mouth while staring him directly in the eyes. Of course I think there’s some emergency. My sister. My niece or nephew. The neighbor. Wrong. No emergency. Just a co-worker of my husband’s who’d been trying to reach him because he needed something out of his car BUT his phone was on silent—so he showed up at our door. Normal, right? Gooooood morning! I’m pretty sure my teeth are a millimeter shorter because of the grinding that ensued. OK! Not sure if you saw my recent artwork on the chalk wall in my kitchen–if not, you can check it out on the Facebook page. Regardless, I noted that I’m having a slight obsession with Reindeer this season. Forget the fact that those giant, 250 lb animals cause car accidents every day in many parts of the country and eat our beautiful shrubbery (that’s right–I just used the word shrubbery)–they’re cute! And they’re hot right now, so I figured I’d throw together a little reindeer inspired gifts board. I have to admit, the Ikea reindeer mugs are definitely on my “want” list. What’s your top pick? This fancy sweater didn’t make the board, but I’m diggin’ it too! I promise I’ll work on my attitude. Scout’s honor. Hi, I'm Jenna! I am an Interior Designer in sunny Florida and I love all things creative and clever. My blog Everyday Clever has recently received a much needed update and is now Bungalow--I'm so glad you're here! Bungalow is all about merging beauty and budgets so we hope you'll stick around and let us share some of our tricks with you!